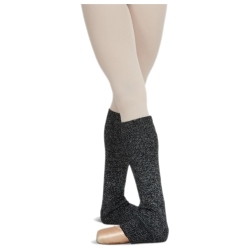 The solid adult legwarmers are perfect for warming up before a dance routine or classes. These adult legwarmers have a metallic shimmer to them. The adult legwarmers are made of 54% acrylic, 34% and 12% Spandex. These legwarmers are available are black and are one size fits most adults.